It was in the late eighties that I was really getting desperate. Being born in 1962, I was part of the "punk"-generation and became really addicted to its more strange off-spring. I am talking of bands like The Slits, Swell Maps, Pere Ubu, Birthday Party, The Fall, The Popgroup that are typical for that era but timeless nonetheless. Ten years after this golden period, things more or less came to a grinding halt. Nothing happened and countless were my visits to record-stores & libraries without finding anything fresh or worthwhile. Than there was this day in the spring of 1988. I visited a clothing store that also had a few trays of sell out-records. Without much hope I started browsing. Then I saw this thick green-red coloured double-album titled EVERYTHING by the artist R. Stevie Moore. As someone once mentioned: The name R. Stevie Moore is often noticed but seldom realized. This was exactly the case, I had heard the name before but I always imagined R. Stevie Moore to be a somewhat dull person because of the rather dull name .... How wrong one can be. I was intrigued by the sleeve that had a nice cover, good song titles, pictures of a guy stuck in a messy room chockfull of tapes, recorders & musical instruments. I decided to take the gamble, after all, the thing was really cheap. I got home & put it on the turntable anticipating an anti-climax. I played it the whole afternoon and was addicted instantly. What struck me most was the great variety of the songs. This guy seemed to master all the styles one could possibly imagine and used them with great taste and in a way that really blended it into a universe that still was a logical whole. With that great voice on top I was sold for good. In the years that followed I bought all his existing albums, all second-hand or very cheap sell-out. What was the matter? Was I the only one interested in R. Stevie Moore? Then there was this: most albums had an address of the R. Stevie Moore Cassette club in the liner-notes. That sounded too good to be true. On top of all the albums there appeared to be a whole bunch of cassettes to be obtained. I wrote a letter & send it .... I never got a reply (after the later events it's probable that it got lost in the mail). Years went by and I kept on playing my precious ten albums. I never encountered a word about the man anywhere. Ten years later: the Internet came and along with it a nifty invention: the search engine. Well off course one of the first things to look for was R. Stevie Moore. 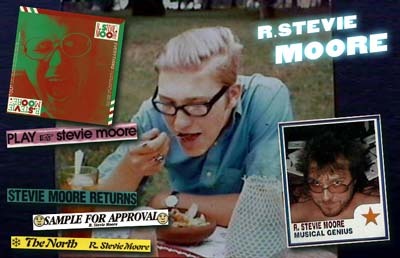 It hit right upon what we now know as www.rsteviemoore.com. That was an eye-opener of the first kind. YES!! R.Stevie Moore was still around and his cassette club was still operational and had a whopping 247 items for sale. I wrote another letter and to my great enjoyment I received a package in the mail with three cassettes along with a very kind letter by the artist himself. The cassettes were incredible, I always imagined that they would be nice but would have lots of duplicates and tracks that weren't good enough to put out on album, something for die-hards like myself. Much to my surprise they turned out to be as rich as his albums. The greatest songs sometimes hidden at the end of C-90's. I really felt like discovering a musical paradise. So here I am. A happy man with a (fastly) growing collection of R.Stevie Moore tapes. (www.rsteviemoore.com/catalog.htm) The addiction demands about a cassette per month in my case, I've got 20 untill now, with 227 to go I will remain happy until February 2019. PSF: Tell us something about your musical influences ... there must be quite a few since you seem almost like a medium that picks styles out of the blue air. PSF: Not only do you use many musical styles, the moods of the songs shift from Syd Barrett-like depressed tunes to crazed Daniel Johnston-like absurdities. By mixing these your tapes almost feel like radio shows. How do you blend them together? Do you just add-on as you move on? You hit the nail on the head with regard to radio show programming. Radio in the sixties and seventies was much more free-form than in recent years. It was like putting all styles of music together in a blender. Talking about individual genres didn't come into play until the late eighties. I wanted everything that I ever heard that touched me to find its way into my musical presentation. It never was a conscious effort. It just was a natural part of me to mix and match. Narrow-mindedness has always infuriated me. Layers of influence were like making a tasty meal. A musical smorgasbord. A thoroughly laundered bedsheet & pillow-case, lightly scented with orchid petals and aired out to dry during a late April afternoon. Station identification. In my opinion, Daniel Johnston does not quite warrant becoming an absurdist's "reference point." Another station identification. Break to commercial. PSF: Tell us something about your cassette club .... how many items do you sell .... to how many people .... which tapes sell best ..... how do people pick from such a large catalogue? The RSMCassetteclub (now known as the CDRSM club) has had its ups and downs. At press time, I guess I've got over 300 separate titles available. Now available on old-school cassette or as a freshly burned-to-order CD-R. A core of 20-30 great customers will keep placing orders for a stretch of time, and then others will order the odd three or four titles. I've never kept records beyond hand-written index cards kept in a little metal file box. Most of them are yellowed with age. The big hits from the catalog are "acknowledged" ones that contain my pop classics of the peak 74-80 era. (Countless folks have said that some of those songs should have been pop hits, if only they were out there for the masses to hear. I guess they know best.) Not really sure if fans were prone to make their choices based on my "listenability quotient" ratings (from the old paper snail-mail catalog), or just as based on recommendation from friends. By the way, I haven't made xerox copies of that catalog for several years. All ordering info is now exclusive to the glorious internet, from the main www.rsteviemoore.com site to my dozens of homemade pages. Somehow, people find their way to all the music. Thank goodness! The very concept of having too much to choose from is really not of interest to me. That's the rub! Ya gonna approach Beethoven's greatest hits CD, or are ya gonna do some research? Ask around? Experiment? In other words, a long slow pleasant shower & shampoo, followed by typical Johnson & Johnson baby powder, stick deodorant, Mennen skin-bracer after shave, Visine eyedrops, Ultra-Brite toothpaste, Q-tips ear cotton-swabs, and milk 'n cookies. PSF: How do you feel about your musical career ... are you satisfied with what you achieved? .... what would you do differently if you could do it again? Ah, a pithy question. I would be more satisfied if I had a staff of promotion people, an art department on call and a talent agent/manager to do the things that I've had to do myself. But, time & time again, that's my ultimate curse: I've gotta D.I.Y. till I bleed, for 100% quality control. RSM fans know that. No assembly-line product here. They expect to get a personalized package completely dubbed, assembled, wrapped & mailed by the artist himself. Over the decades, I've barely lucked out to get the occasional gig or placed with some indie record company who wanted to release my music on vinyl or CD, but it's never been a case of making a real career out of what's more like a dedicated hobby. What amazes many people is that I've done what I have for such a long time. To put it succinctly, approximately 65 degrees, partly sunny, humidity 45 per cent, light wind from the southwest, at 1:30 pm EST. PSF: What record companies did pick you up? PSF: How about the New Rose era? How 'bout that!?! By far the most devoted label this boy's ever had. They didn't sell many copies, but they stayed with me for quite awhile. PSF: Were you really a pop star in -of all places- France? Slight exaggeration on my part. Beg your pardon. Just my first, Phonography, available now. PSF: Delicate Tension out yet? Ah, the classic second album is only obtainable as a CD-R, directly from me. PSF: Tell us something about what the effect was of moving from Nashville up North ... this must have been a special time for you because at just about the same time the whole punk/DIY movement evolved. Extraordinary era! Moving from Tainuhsee to Joizey was not unlike Dorothy traveling to the Land of Oz; especially at first, with so many early promises of opportunity. Met a lot of really creative and sharp people who unexpectedly made some important contributions to my cause like Kurt Loder, Ira Robbins and David Fricke, each of whom wrote some very influential RSM reviews that got my name out there fairly quickly. It was all genuine praise and it happened at such a prime time in what's become a golden era for attentive music fans. PSF: When did you realize that suddenly a lot of similar minds stood up & started working the way that you must have been doing for quite some time .... could you name some influences from that era? Oh, I suppose you mean groups like Sebadoh or Guided By Voices. Never followed them or anybody else, really. There was a time when reviews of my work would make mention of those groups, I guess for the kids to have a reference point, but I didn't have an idea as to what they sounded like. I was more interested in absorbing the sounds of the past, obscurities that didn't really mean much to any scene. Heck, I wasn't recording on my own back in 1973 to start a trend or a goddamn movement. I guess, like Dadaists, I was reacting to what was around me and putting myself forth into the world. Thankfully, I was never incarcerated nor interrogated by the feds because of my music. If I've got a musical idea in my head, it doesn't matter if it's inspired by masturbation or an ironic sandwich I ate. Would you question Lenny Bruce's material when he brilliantly rants about the verb to come and makes it so frigging entertaining? It's all about sharing our humanity and all of the mundane or profane things we do. With that said, I gotta go pee. Be right back. PSF: I did not mean the authorities here but more some of your potential audience. Unclear. It's who I am. May scare off some, may lure others. I never ever determine when or when not to appear "blunt" in what i issue to the public. Self-censorship? Bah!! PSF: Try and describe a RSM fan ... are they as diverse as your music is? It takes all kinds. There's no "stereotypical" RSM fan. Thank Christ. Would you expect there to be? One constant: they're all "individualists." Whatever that means. In addition: it's naturally difficult to determine if there's any discernible difference between the guy that orders 1 or 2 RSM cassettes, and the guy who orders 50 to 100 RSM CD-R's (except in his disposable income budget). I love 'em all equally. Not! PSF: Can you describe a typical RSM day in the year 2000 .... how does it differ from lets say 1990 or 1980? Too personal to reveal. Don't wanna depress you. PSF: OK... but how about making music ... are you still productive? PSF: How about your forthcoming European tour? What can we expect? PSF: What about the internet: Your personal site is growing so fast it seems that it'll soon choke the entire net .... how did you do it? Got any help? I do it all using WebTV which is a simple internet terminal that is set up to use your TV as a monitor. It's got a basic modem and allows you to go everywhere on the web. Storage is on a WebTV account on their server. Sheesh! When my wife and I first got it, I told her that she was going to be the one to use it and I would have to be an innocent bystander. You see, I have zero computer experience and still don't do windows. : ) I started out getting addicted to email and surfing the net how to use HTML and where to go for all the widgets & stuff to create my own webpages. Like my foray into video, I've used the internet to become a diarist. If I were to get a computer with a webcam, watch out! R. Stevie Moore 24/7. PSF: Do you think the Internet has led to a second DIY era? For me? Emphatically yes. For DIY in general? I haven't noticed. Everybody else in the "www.underground" continues to appear aiming for the mainstream, yes? All style, no content. Correct me if I'm wrong. Honestly, I firmly believe that what I'm now doing with my websites runs smoothly parallel with what I was doing 25 naive years ago. The exact same vision, whatever it may still be. PSF: Do you think you're disabled by talent? I mean, would you be a rich man if you'd only specialised more into one area? By all means. Modern talent from the underground has no inkling of a chance in today's market. To be such a versatile artist is suicide. Always was my downfall. It sure has made it harder to be dumb and play the music biz game. But, these days, the record companies are starting to tremble at the prospect of no longer being able to do things like they used to. Adventure is obsolete. This author has no clue. Burnt to a crisp. PSF: Can you make a living out of it as it is right now? No sir. A dying, crying shame. PSF: Tell us something about WFMU .... do you still work for them? They've got a long history as being a pioneering freeform college radio station with no formats, each DJ was in complete control of what they played. Uncertain of what their relevance is today. Don't listen that often even though they still play my music. I'm a proud alumnus. Have had no direct connection since the mid-'80s. Many pals, come & gone there. FMU, too, has had to adapt to the changing times. PSF: What about your videotapes ... I never saw one ... could you tell us something about them? Slapdash visual tomfoolery, intimately revealing soliloquies & rants, genre-jumping musical vignettes, decades of all of my friends, classic RSM songs lip-synced or performed, radio shows, historical footage, silly skits, art exhibits, low-quality editing, many live concert gigs, TV appearances, infamous kinfolk & guest stars, questionable redeeming social values, homemade uncontrolled mayhem.....(Just like the audiotapes, but for the eyes). PSF: C'mon R. Stevie, try harder! There must be some items that you like best ... how do you pick songs for your albums? Honestly cannot rate preferences for my 30 years of music-making. Variety rules. Love the worst noise as much as the best melody. My 1988 album Teenage Spectacular is my most accessible, by normal standards. So be it. Yet, I'll also forever stand by my most wretched, hissy home demo innocence. Doesn't matter to compare. I simply can't. I'm proud of every note I've ever taped. Which may or may not hint at the answer to "how I pick songs for albums." No, they pick themselves. Automatic understanding. PSF: Seems to me that the way you always let your listeners into your life is kinda analogue to the way people who have a webcam ... is this going to be the next step on your internet path .... where does this behaviour come from ... does it have to do with exhibitionism .... do you really share your whole life .... Is it all fact or is there some fiction? Please rephrase the query. How could I ever confess the truth, when I am so innocently ignorant to that? Mets win! Giants lose! You want honesty or calculated iconoclasm? I expertly excel at hiding from loved ones, as well as spilling slimy guts onto all my art. Paradox? Or something different? Needle-nosed pliers notwithstanding, god steers me towards the prevention of carbonated beverages losing their fizz. What performer in the arts / entertainment is not half-exhibitionist / half-inhibited mysterioso?? Name me one, and I'll certainly play the local lottery. Showing off is what kids do. A severe sort of desperation, psychologists would claim. Got milk? On Ebay? PSF: Where did your musical career start .... at what point did you first do your first typically RSM things? Piano lessons 1961? First guitar 1965? School chorus 1966? First immature recordings 1967. First accomplished "songs" 1972. First hit 2001. Ah, youth. The only thing that matters. A bitter 20 year old is no match for a bitter 50 year old. With cream, no sugar. Retired. PSF: Can you mention some of the people whom you have worked with ... who were really influential? Influenza to me, or the Great Society?? Father Bob, Dave Gregory, Chet Atkins, Perry Como, Jerry Reed, the Manhattans, Connie Smith, Terry Burrows, Bill Anderson, Irwin Chusid, Pete Drake, uncle Harry Palmer, Earl Scruggs, et al. Get this: somebody once told me: John Lennon allegedly heard & had a favorable comment about, my 1975 Beatles instrumental tape. Ripley's believe it or don't. Sheesh, what kinda gossip-igniting question izzat? No, no. Nobody. Just me. PSF: Did you ever have the feeling that you were part of a larger musical or cultural movement? As if. Got a match? PSF: What do you do apart from making music .... Do you ever have any free-time? Bad news. Making music? Ha! Been there done that. I'm barely able to attend to filling RSM orders. Ill health has confined this old geezer to merely loitering in cyberspace: building webpages, playing in the e-mail sandbox, & mindlessly surfing the www for a cosmic answer. Poor little fool. Recent biggest rebellious accomplishment? Growing a free-flowing ZZ.Top beard! Time's running out, pal. Gonna seek a job as a hobo. Here's my resume. Can you read my pencil shavings? (cough) Goodnight sweetheart. PSF: One last thing; did you ever go from C major to C minor in one of your songs? 162 times. I'll compile all of those progressions into some sort of "happy / sad" suite, each a quick edit, and....... send you a copy. PSF: What's your favorite color? Yes, 160 daughters & 2 sons. They're all in college, sitting on daddy's lap. Maybe that's why this interview is unusable, eh? PSF: Could you sing for us? Well that should give some insight on our hero. Check him out yourself on the RSM official page (including cassette-club): www.rsteviemoore.com Or go to RSM’s own pages, a good starting point: www.angelfire.com/nj2/rsmkjo/index.html (beware! you might get lost here) Write him an email: RSMko@webtv.net. But above all: BUY HIS MUSIC!! Thanks to Richard M., Ubu Roi, Mickey D. & Bertie Brinta for feedback. If you have any comments, please mail me at redbol@extrapool.nl, check http://www.extrapool.nl/redbol.html for my regular work.